Wish you all a very happy and prosperous diwali. I wish thalai diwali for newly married couples as I am enjoying the same. Diwali is festival of lights and sweets. Diwali always glows in the fresh smell of oil bath, new dresses, sweets, snacks and crackers. 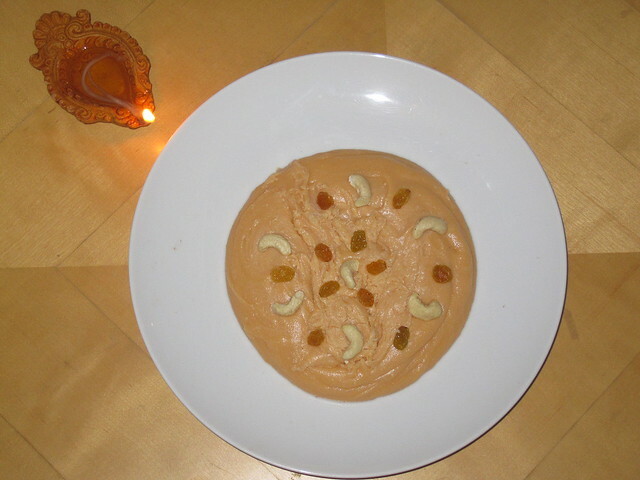 I thought to prepare Badam Halwa and tried the same for diwali. Surprisingly, it came out good as i am new to cooking . I felt happy and my hubby also liked it .So, lets go to the recipe by wishing safe diwali to all . ﻿ I am sending this recipe for DIWALI SWEETS AND SNACKS EVENT hosted by Lavi.Try this recipe for diwali and enjoy it. Cardamom powder - as required. Soak the Badam in water for 3 hours. Then peel the skin. Alternatively, the badam can be boiled in water for 30 minutes and then the skin can be peeled. Grind the peeled badam and milk in a blender. Grind until the mixture becomes a coarse paste like dosa batter. Keep a non-stick pan on low flame and heat it up. Pour 2 tbsp of ghee on the pan. Once the ghee has heated up to consistency, add the badam paste and sugar. Stir the mixture continuosly so that it does not sticks to the pan. After 5-7 minutes of stirring, add the saffron to it. The stirring should be continuos and consistent, else the paste will get burned. When almond paste gets boiled, add 2 more tbsp of ghee and stir it. Dissolve the food colour in water and add to almond mixture. The oil starts to ooze out of the halwa, indicating that it is cooked. Finally, add cardamom powder which gives out a good flavour to the halwa. Now, almond halwa is ready to serve. 1. Use a non-stick pan. Else, the halwa will stick to the surface. 2. The stirring should be continous, as the halwa will get burned, even if you are idle for just a minute. 3. Sugar should be used in 1:1 ratio with the badam. 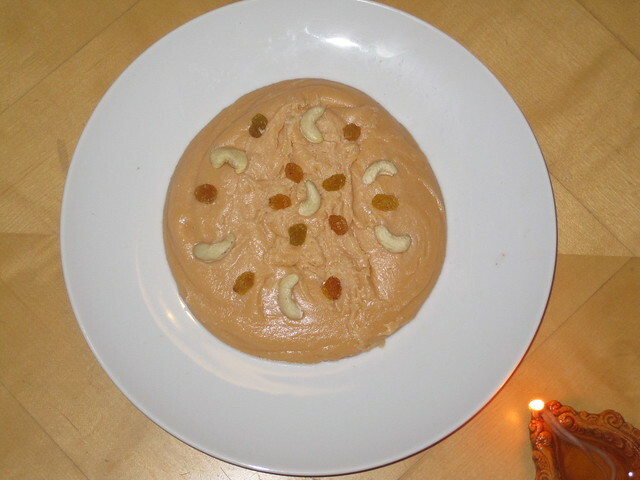 Transfer the badam halwa to a plate or bowl and garnish it with cashew nuts and raisins. I like your blog layout and header and the variety of recipes u share. Its hard to see such things from new blogger. Have a Great Learning , Coooking and Blogging Experience.. Enjoy Dear!